New Mexico's Turquoise Trail is one of the state's most visited backroads, and for good reason. A National Scenic Byway, the trail passes through a scenic and historic area of about 15,000 square miles in central New Mexico. 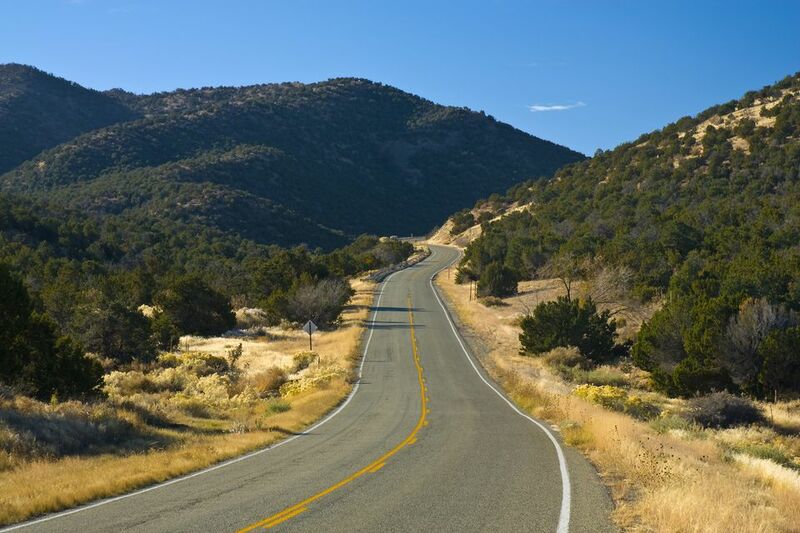 The 50-mile road follows Highway 14, just outside of Albuquerque on the southeastern edge of the Sandia Mountains. It travels north and ends in Santa Fe. The trail is beautiful year round and features several places that are worthwhile visiting along the way. The trail begins in the small town of Tijeras in the mountain foothills. Begin your sightseeing trek at the Visitor Center for Cibola National Forest. Located just south of I-40 along Highway 337 in Tijeras, an ancient archaeological site contains the remnants of Tijeras Pueblo, a village where indigenous people lived long ago. The site offers interpretive trails where visitors can learn about the history of the pueblo which flourished from 1313 to 1425. There are also nearby hiking trails and picnic areas. Further north just past Tijeras, the Sandia Crest road offers recreation, picnic areas and hiking trails for those who love the outdoors. In winter, there is skiing at Sandia Peak, or snowshoeing and cross country trails through the beautiful forests. The crest road also features Tinkertown, a one of a kind museum with miniature dioramas and a hodge podge of interesting objects. There is no place like it in the world, and people come from all over to see it. Tinkertown is located in Sandia Park. Continue north into Golden, the site of the first gold rush west of the Mississippi. The Henderson Store carries Native American arts and crafts and has been in business since 1918. Shop for rugs, pottery, jewelry and more. The next stop north is another town that got its start with mining, Madrid. Once a place where both hard and soft coal were mined, the small miner homes now serve as shops, restaurants, galleries, and taverns. The town has been a place for artists and craftspeople since the 1970s. An original tavern continues to serve libations, and the Old Coal Mine Museum has left some of the buildings and equipment from the town's mining heyday. An old train engine serves as a place for eager kids to pretend they're a conductor. In the summer, there is a Fourth of July parade and every weekend in December is set aside for Christmas lights and celebrations. A visit to Madrid wouldn't be complete without a visit to the old-fashioned Jezebel Soda Fountain, which still has its 1920s soda fountain. Further north, the town of Cerrillos marks the place where mining took place for turquoise, gold, silver, lead, and zinc. The town had 21 saloons and four hotels. Today, its charm is in its look of the old west, and its shops and galleries. Visit the Casa Grande Trading Post and Petting Zoo, another one of a kind place. Continue north and just before getting to Santa Fe, stop in at El Parasol, known for its New Mexican food. El Parasol is located in the area called Top of the Trail, because you've come to the end of the Turquoise Trail.